Oklahoma’s schools are starting another school year with more than 500 teaching vacancies despite record numbers of emergency certified teachers and the elimination of more than 400 teaching positions since last school year, according to a new survey from the Oklahoma State School Boards Association. Nearly 75 percent of districts that responded to the fourth annual OSSBA survey said they expect to rely more heavily on emergency-certified teachers this school year – a 10 percent jump compared to last year. By the end of this week, the state Board of Education is expected to have approved more than 1,400 emergency certificates for the current school year. That’s nearly double the number approved during the same period last year and exceeds the record of 1,160 approved for all of last school year. Districts also continue to increase class sizes and hire retired teachers as they struggle to find qualified teachers among a shrinking – and at times non-existent – applicant pool. OSSBA Executive Director Shawn Hime said parents, educators, community and business leaders and legislators must work together on a long-term funding plan that provides competitive teacher pay and resources to provide all students a high-quality education. Far too many teachers are moving to other states or leaving the profession, he said. Districts reported 536 teaching vacancies as of Aug. 1. 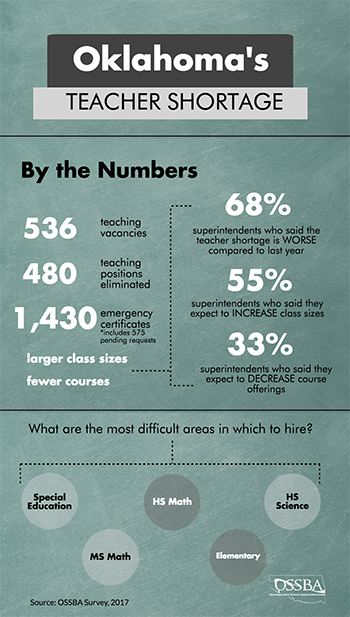 Districts have eliminated 480 teaching positions since last school year. Districts reported eliminating 444 support positions since last school year. Two-thirds of districts reported hiring was much or somewhat worse than last school year. Special education teaching positions are the most difficult to fill, and many districts have reported special education teaching vacancies for multiple years. Special education teachers aren’t eligible for emergency certification. After special education, high school science, high school math, middle school math and elementary teaching positions were the most difficult to fill. More than half of districts said they would increase class sizes to cope with the teacher shortage. Projected average class sizes of 26 or more students were most common at the middle school (20 percent) and high school (21 percent) levels. Nearly 52 percent of districts said they may hire retired teachers and nearly 40 percent may hire adjunct instructors to fill gaps. Districts also plan to rely more heavily on existing staff by paying teachers to give up their planning period (33 percent) or assigning teaching duties to administrators (29 percent). One-third of districts anticipate they’ll offer fewer courses. As the number of emergency certified teachers continues to grow at a record pace, this year’s survey asked district leaders to describe their experience with such teachers. The results were decidedly mixed in part because some emergency certified teachers are looking for a new career while others view teaching as temporary employment. Some district leaders said they’re happy with the emergency certified teachers they’ve hired, and some have completed the requirements for full certification. Others lamented teachers who quit before the school year ended, struggled throughout the year or were unable to pass the tests needed for full certification. They also noted growing class sizes makes the job of an inexperienced teacher even more challenging. “The greatest difficulties for the emergency and alternatively certified teachers are classroom management and developing good relationships with parents and students,” said Stephanie Curtis, executive director of personnel and school support for Bartlesville Public Schools. Bartlesville, like many other districts, is providing extra and/or specialized training for emergency certified teachers and relying on veteran teachers to serve as mentors. Even districts that had positive experiences worry about the toll the growing number of emergency certified teachers is taking on experienced teachers who must step up as mentors either at the request of the district or simply out of their concern for students. Administrators also report spending significantly more time providing instructional support and coaching for emergency certified teachers. Some districts are actively working with higher education partners to develop additional support for teachers who lack traditional training but aren’t sure they’ll find funding. Concern about the long-term effects of the teacher shortage runs deep among school board members, said Roger Edenborough, a Goodwell school board member and OSSBA president. He said he hears often from superintendents concerned about the scarce number of applicants and from fellow board members that the increasing dependence on emergency certificates, retirees and adjunct instructors is a worrisome new norm.